As you may have noticed, Christmas is right around the corner. For those who have children or grandchildren, the holidays can be a great season of frenetic activity, parties, lights, decorations, shopping and more. But sometimes you want to spend quality time together that doesn't involve leaving the house and won't break the bank. What's a parent to do? Below are seven activities you can do with your children when you have an afternoon free or when you've cleaned up from dinner and want to do something different to celebrate this joyous season. Some take more time than others, and some take a few more materials than others, but they are all fairly easy to do with children of all ages. Enjoy! Use a large sheet of green paper to make a Christmas tree shape. This can be a simple triangle, or it can be as elaborate as you'd like. Don't have a large sheet of green paper? Tape several sheets of green construction paper or scrapbook paper to give yourself one large shape. Let your kids decorate homemade ornaments from construction paper, string, crayons, glitter (if you're brave!) or any other found materials. Hang the paper tree on a wall of your house at kid level and let your kids decorate the tree. Christmas stickers or even round mailing seals make great ornaments as well. Make cinnamon Christmas ornaments! Mix cup applesauce and about four ounces ground cinnamon in a small bowl until a smooth ball of dough is formed. Roll dough to 1/3-inch thickness. Cut dough into shapes with small cookie cutters. Make a hole at the top of each ornament with a drinking straw or skewer. Bake 2 hours in a preheated 200 F oven or let ornaments air dry for 1-2 days on a wire rack. Insert ribbon in the holes and hang the ornaments around your house. 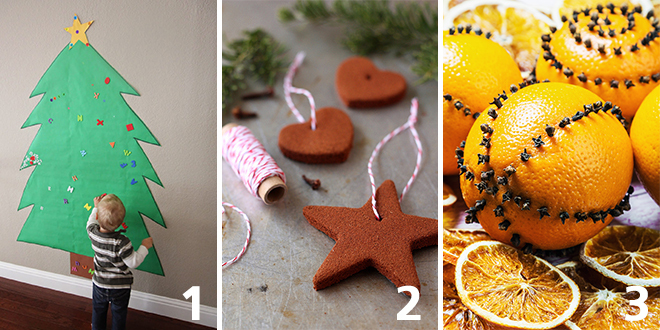 Make orange and clove ornaments (for older children). Insert whole cloves (purchased in the spice aisle of your grocery store) into the skin of an orange. Place them randomly or create a pattern with the cloves. Wrap a ribbon around the orange and hang it in an open part of your house or place them in a bowl on a table. The orange and cloves will give your house a wonderful scent! Attach a long rope, twine or heavy string to a wall in your house. The rope can be hung horizontally or vertically. Attach clothespins (paint them if you'd like) to the rope and hang Christmas cards as they arrive in the mail. Don't receive Christmas cards in the mail? Display small miniature "masterpieces" your kids have drawn! 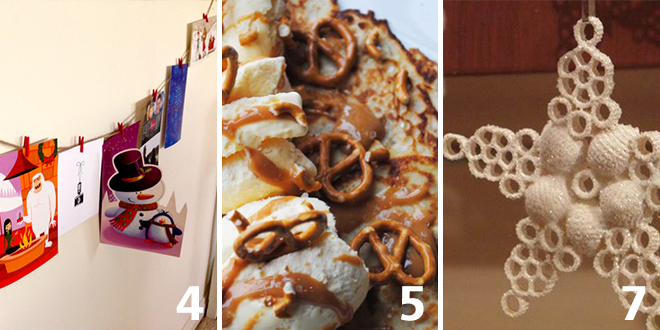 Have a personalized pancake dinner. Make pancakes as usual, but instead of putting butter and syrup on them, let everyone experiment with different toppings. Some suggestions to try include chocolate syrup, any flavor of jelly, honey, agave, chocolate chips, coconut, fruit, brown sugar or whipped creamthe choices are endless! If you're feeling especially creative, use the toppings to create Christmas ornaments using the round pancakes as the ornament base. See who can create the most unusual ornament. Have a snowball fight! Crumple up recyclable white paper sheets into tight balls. You'll need about 20 snowballs or more depending on how many people are in your family. Have fun snowball "fights" or play this game with them. Divide your living room (or other room of your house) into two halves. Use a piece of rope, string or tape, or find some other way to divide the room. Form teams. At the "go" signal, each team can try to get as many snowballs onto the other teams' side of the room before a timer goes off. The team that has the least snowballs on their side is the winning team. Make pasta snowflake ornaments! Use different shaped pasta (tubes and wagon wheels work especially well), and glue them together on waxed paper to form snowflake shapes. After the ornaments are dry, paint them with white paint or white shoe polish (using a dauber), sprinkle with glitter while wet and then let them dry. Hang up when finished. The post Seven Creative Christmas Activities for Parents appeared first on Today I Saw God. There's just something about a father, isn't there? It's been nearly two years since my earthly father went on to glory, but the celebration of his life feels like it was yesterday. What a collection we were, gathered there to pay our respects to the guy we remembered. There was the golf group recalling the yips he got on short putts, bridge partners remembering the joy the game gave him, business partners and employees reminiscing about the mind and method of a man on a mission, the Starbucks cohort retelling stories of the ever-present tall, black coffee with ready conversation and the family coming to realize just how much of this man they didn't know. A bit of an enigma, this guy, but put us all together in one room, let us share stories, and lo and behold we're all talking about the same guy. Yips, joy, mind, method, coffee and conversationyup, that was how we remembered John Rilling. Funny, as I mingled with the crowd gathered after the memorial service, guests made a point to tell me how they knew my father. They all qualified themselves with a category. A "golf friend," a "bridge friend," a "business associate," etc.the conglomeration was downright confusing. I joked with Adam, a young man whom Dad had employed and mentored in recent years, that we all needed colored T-shirts to represent the John-team we were on. He laughed and said, "That's exactly what your father would have said!" I especially loved chatting with an athletic looking, sport shirt-clad man named Mark, who was in a wheelchair. He was a golfer who used an assistive device that allowed him to stand from his chair so he could swing the club. But my father felt that if Mark had something on his chair that widened his base of support he could really improve his game. That feeling, according to Mark, led to connecting him with the head golf pro at the golf club to see how this could be created. Mark told me he had just discovered a video demonstrating such a device in use by another disabled golfer who could now hit the ball 300 yards. Mark lamented that my dad didn't have time to see this video. "He would have loved it," Mark told me. That made me smile. "You have your Dad's smile," Mark said. Yep, Dad always had that spark of an idea. There was always something more we needed to do with this or that. There was an idea ready to be uncovered, ready to be acted upon, raring to go. That was Dad. Not trying to make a fortune. Not trying to get attention. Just trying to solve your problem, and yours, and yours. He lived simply and was completely satisfied, but he didn't settle for that. This was not discontent for him; it was purpose. He did not want what you had, he wanted what you wanted and immediately mobilized to help you realize that desire. But only if you were in honest pursuit, which meant you were willing to work hard and apply all your resources to the project. That was his directive in every day. Some people who came to the memorial service did not know my father except through his wife, Melanie, whom he adored. They came on this day because of her. One introduced herself to me and offered sincerely, "We didn't know your father, but after hearing you and seeing you, now we do." That would be enough. If I could live out my days in such a way that people remarked, "You remind me of your father," I would be content. Especially if I were similar in his joy, mind, method, coffee, conversation, connection, solutioneverything but the yips on my short putts, if you please. But yes, I even inherited the tendency toward those. Guess I'm more like my father than I thought. What a privilege. What a responsibility. On this Father's Day, as I remember the love of my earthly father I will marvel again at what he taught me, modeled for me, ignited in me and imparted to meall of it mostly without my ever being the wiser. It just happens. When you love someone, they become part of you. If that's the way with a good dad, just imagine the way of a good, good Father. The post You Remind Me of Your Father appeared first on Today I Saw God.